Magnolia and Palm were the original courses to open at Walt Disney World back in 1970 and a few years later the Lake Buena Vista course was added. The late Joe Lee designed them all. “Gentleman” Joe Lee designed and updated more than 250 courses with perhaps his most famous solo design being San Lorenzo in Portugal. The Walt Disney World Palm course is the only track ever to have been voted onto an all-comers US Top 100 list but that was way back in the early 80s and things have changed enormously at the resort since then. In the late 80s, Ron Garl added a 9-hole course, aimed at the less experienced golfer. Tom Fazio and Pete Dye added the well-regarded Osprey Ridge and Eagle Pines courses in 1991. Sadly, Disney decided to bulldoze the Eagle Pines layout to make room for other developments and in 2013 the Osprey Ridge course closed, pending transfer to the new Four Seasons Orlando Resort. 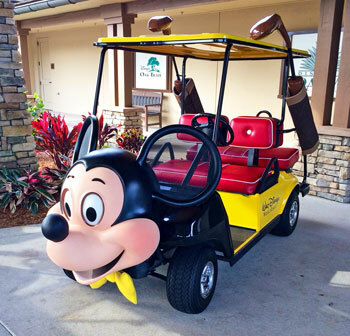 However, there are still plenty of golf holes from which to choose, 63 to be precise, so the Walt Disney World Resort remains a golf destination of repute. The Palm and Magnolia courses hosted the Disney Classic from 1971 to 1973 and the “Golden Bear” Jack Nicklaus won the event each year. The tournament was then converted to a team format – presumably to prevent Nicklaus from winning even more titles – until 1981. The event then returned to the original format and the Lake Buena Vista course was added into the mix. Today, the PGA Tour event is played on the Magnolia and Palm courses, just as it was in the early 1970s. The toughest hole and longest par four on the Palm course is undoubtedly the 18th where the final third of the hole is an island. Two solid and very accurate shots will be required to find the green which is set tight to the water on the right and is guarded by four bunkers on the left. This hole is currently the 4th hardest on the PGA Tour and a par here deserves celebrating. “Welcome to the happiest place on turf” is the warm welcome at the Disney courses – not too sure about happiest but it is certainly great fun. Disney courses should not be ignored when visiting Orlando and whilst they may not blow you away, there are plenty of decent holes and the obvious high level of customer service is everywhere. The Palm is a lush parkland course and has had a make-over by Arnold Palmer Design in 2013 and right now is bedding in but the early signs are pretty good. The holes are shaped through great looking woodland and most have the familiar looking lakes and tropical sand hazards all around. The 3rd hole is a very nice mid-length par-3 skirting a lake with three bunkers protecting the sloping green; this hole is often photographed from above and used as one of the showcase holes. For me one of the big plus points are the finishing stretch of holes; the last six are very strong indeed and with the exception of the 17th, there is water in play everywhere! Of this great set of holes, my favourites are the 14th and the home hole. The 14th stretches to 547 yards, it has a huge lake down the right-side and then another to negotiate on the lay-up shot, then five bunkers surrounding the green. The 18th is stroke-index 2 and a 454 yard par-4- it has water crossing the fairway at around 370 yards and this is then in-play on all sides of the green – this watery grave should not too difficult to avoid but it is definitely in your mind as you end your round. The Palm has a ranking towards the back-end of the Florida Top 100 and that feels about right.